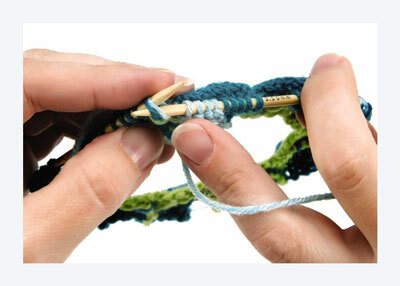 The architecture of entrelac is different from that of other types of knitting. Entrelac fabric is composed of tiers of blocks that are set on their points, forming diamond shapes. 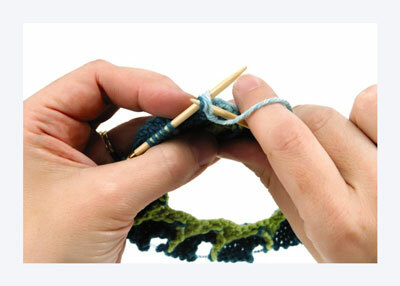 Each block is worked individually and joined to its neighbor as it is being knit. Entrelac fabric can be created by knitting either flat or tubular shapes. In either method, you make the individual blocks one at a time by turning the work for each row of stitches. The basic process is outlined here. In this example, each block contains 5 stitches, and each tier contains 10 blocks, so you cast on 50 stitches. Cont this patt, adding 1 st on every WS row, until you have 5 total purled sts. Do not turn, but start Row 1 again, purling 2 more sts. Cont across the CO row until all 10 triangles have been formed. Each tier of entrelac begins with the opposite side of the work facing you from the last. The first tier of tri-angles started from the WS, so the next tier of blocks begins on the RS. Break the first color of yarn and join a new one. 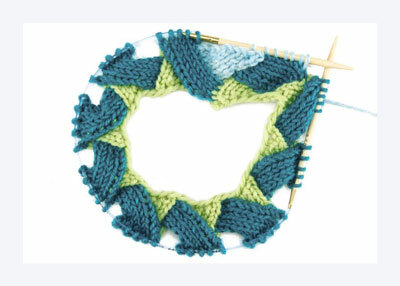 Join the round of knitting by working your next block along the edge of the first triangle. 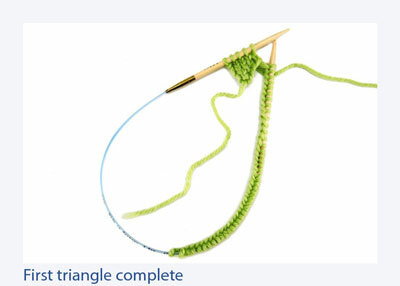 Row 1: At the edge of the first triangle immediately to the right of the beg of the rnd (the first triangle that was created), pick up and knit 5 sts through the triangle’s selvedge edge, turn. Row 3: K4, ssk (last st with next st of prior color, joining to the triangle), turn. Rep rows 2–3 until all of the triangle sts have been worked into the new rectangle. Work next new block from edge of next triangle to the left. Rep until all the triangles have been worked. The 2nd tier (first tier of blocks) is now complete. 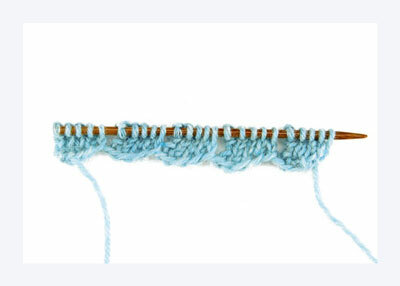 An entrelac tube can be closed at the end by knitting progressively smaller blocks in each tier until all the blocks are reduced to nothing. The resulting bowl or dome silhouette works perfectly for hats and bags, while the flowerlike motif formed by the diminishing blocks adds a beautiful design feature. To make decreased blocks, pick up the same number of stitches as in the previous tier of blocks, then decrease 1 stitch (k2tog on RS, p2tog on WS) in the second row. Continue decreasing the size of the blocks in each tier until only 1 stitch remains, then run the working strand through all stitches, fastening securely on the WS. Work a finishing tier of triangles to fill in between the points of the blocks in the prior tier, and end the piece with a straight edge. Row 1: For first triangle only, pick up 1 more st than used in the prior tier of blocks (in this case, 6) from edge of next block, turn. Row 2: Knit across all sts, turn. Row 3: P2tog, purl to last st of triangle, p2tog (last st of triangle tog with next st of adjoining block). Cont alternating rows 2 and 3 until 3 sts remain (2 sts from new triangle and 1 st from adjoining block), ending with Row 2. P3tog, and do not turn. For the next and all remaining top edge triangles, pick up and purl 5 sts from edge of next adjacent block. One st remains on needle from prior tri-angle, for a total of 6 sts. Rep steps until all sts from prev tier have been joined to triangles. 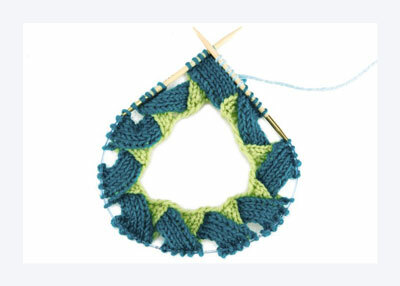 Knitting entrelac flat is the same as knitting it in the round, with one notable difference: The flat piece requires that triangles be inserted along the vertical edges to produce a straight edge. Row 1 (RS): K2, turn. Row 3: Knit into front and back of st, ssk (1 st from new triangle and 1 from prev tier triangle), turn. 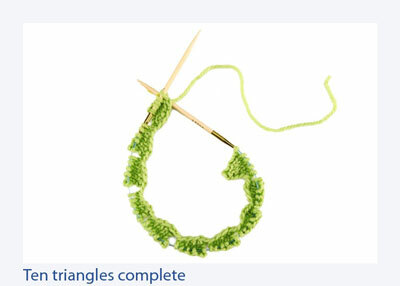 Row 4: Purl across triangle, turn. Row 5: Knit into front and back of st, knit to last st of current triangle, ssk, turn. Rep rows 4–5 until all sts of triangle in prev tier have been used. Do not turn after final Row 5. Pick up sts from next adjacent triangle and cont making blocks as for circular entrelac. When you have filled in the spaces between triangles with a new tier of blocks, you’ll need a triangle on the left side to make a straight edge there. 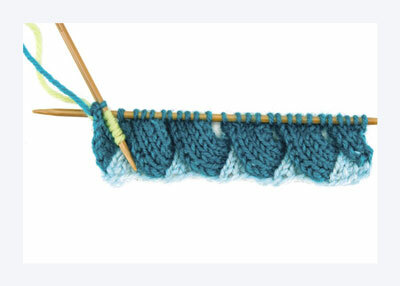 Row 1 (RS): Pick up and knit 5 sts along rem edge of last triangle. Row 2: P2tog, purl to end of sts you just picked up, turn. 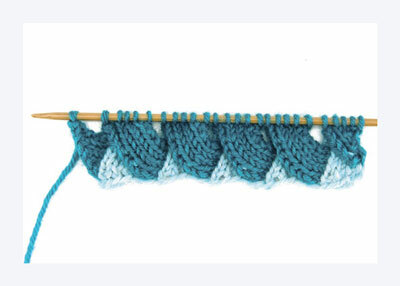 Row 3: Knit across, turn. Rep rows 2–3 until 2 sts rem. P2tog, but do not turn. Break yarn, fasten off last st, and tie in a new color. Beg next tier of blocks by picking up 5 sts from selvedge edge of left-side triangle. Although the examples here use 5 stitches in each block, you can make your blocks any size you like, depending on the piece you are making and the gauge of your yarn and needles. It’s easy to experiment by making swatches with different-sized blocks.